Faux fur long sleeved hooded coat for baby girl. 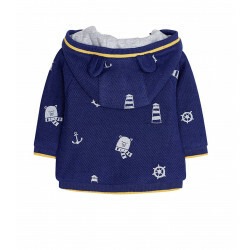 The bottom hemline is elasticated and there are hidden clasps on the front which allow the coat to be fastened easily. 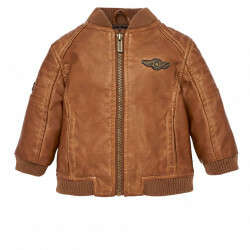 It is made from soft faux fur fabric and has an appliqued bow by the collar.100% Polyester..
Long sleeved bomber jacket with elasticated cuffs for baby boy. There is an adjustable drawstring round the waist and two pockets on the front. 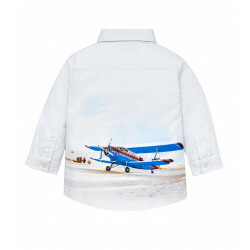 The outer material for this jacket is made from padded leatherette fabric, and there are backstiched details as well as decorative patches on the front. 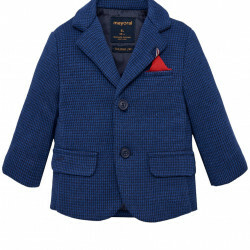 Thi..
Long sleeved blazer with lapel collar for baby boy. There are buttons down the front and mock, decorative pockets. 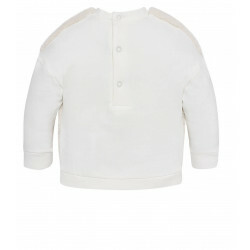 The blazer is made from warm, soft, thick knit fabric.53% Cotton37% Polyester10% Polyamide..
Long sleeved hooded sweatshirt for newborn baby boy with elasticated cuffs and bottom hem. There is a zip down the front to fasten. 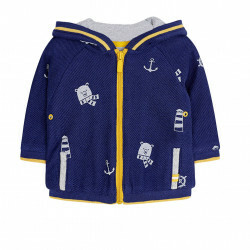 It is made from comfortable, soft fleece fabric and has decorative washers. Designed with 2 pockets and decorative washers. 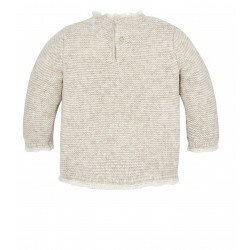 Patterned design.100% Cotton..
Jumper for baby girl with detailing around a round neck collar. 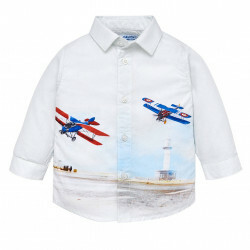 There are button fastenings on the back, making the item easy to put on and take off. 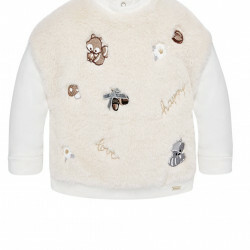 It is made from thick, warm and soft knitted fabric and is embroidered with fur applique in the design of a squirrel.60% Acrylic 35% Polyamide 5..
Jumper with a contrasting coloured round neck collar for baby boy. 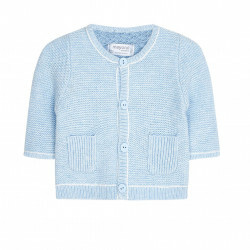 There are button fastenings on the shoulder, making the item easy to put on and take off. 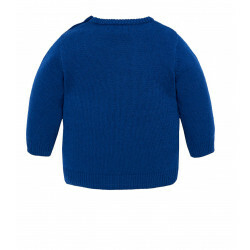 It is made from thick, warm and soft knitted fabric. 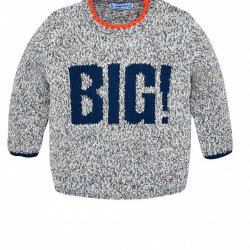 There is also a text feature on the front and back of this mottled effect jumper.74% Acryl.. 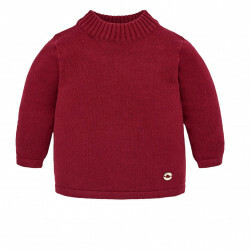 Round neck collar jumper for baby boy. There are button fastenings on the shoulder. 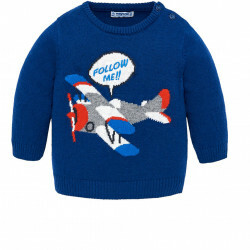 This jumper is made from thick, warm and soft knitted fabric and has an aeroplane motif on the front.60% Cotton30% Polyamide10% Wool..
Jumper for baby boy with a round neck collar. 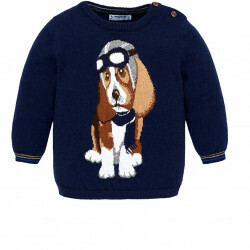 There are button fastenings on the shoulder and it features a dog design on the front. 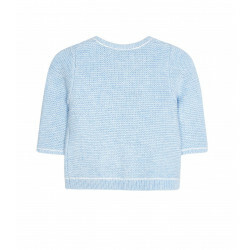 The jumper is made from thick, warm and soft knitted fabric.60% Cotton30% Polyamide10% Wool.. 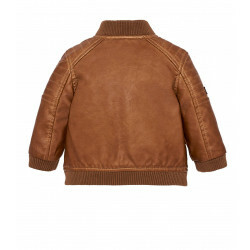 Jacket for newborn baby with a round neck. 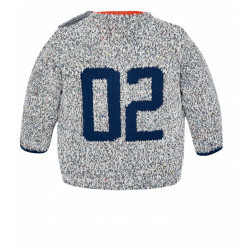 There are button fastenings down the front of the item, making it easy to dress your child. 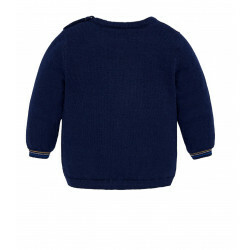 Made from warm, soft thick-knitted fabric with fully functional patch pockets on the front.94% Cotton6% Polyamide..
Baby girl jumper. Basic, comfortable and warm. 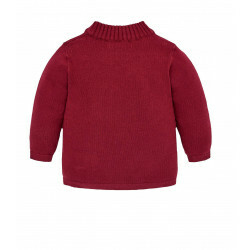 This garment is made of a blend of fabrics: elastane, polyamide and cotton,cotton being the main one, which guarantees a soft and pleasant touch.The most striking aspect of this garment is its semicircular neck, somewhat higher than that of the classic ..